For a brief time after the murders of his pregnant wife, Sharon Tate, and some of their closest friends, director Roman Polanski believed that Bruce Lee may have killed them. People who heard that Quentin Tarantino plans to include Bruce Lee in “Once Upon a Time in Hollywood” — his upcoming film revolving around the Manson murders — may have been understandably baffled. What did the martial arts master, who died tragically at 32, have to do with the Manson family breaking into Polanski and Tate’s home and killing everyone they found there? This answer, it turns out, is a pair of glasses. It was the summer of 1969, and Polanski was in a state of deep despair at the murders. No one yet knew that Charles Manson’s followers had carried out the grotesque killings, in hopes of sparking a race war. One day, Bruce Lee mentioned to Polanski that he had lost his glasses. Polanski paid close attention, because someone had left a pair of glasses in his home, and detectives believed they might belong to the killer. He also knew Bruce Lee was one of the few people who might have been physically capable of killing a house full of people, all by himself. Listen to the podcast for Polly’s retelling of what happened next. The segment on the Manson murders begins at the 15-minute mark. Lee’s influence on Tarantino can’t be overstated. 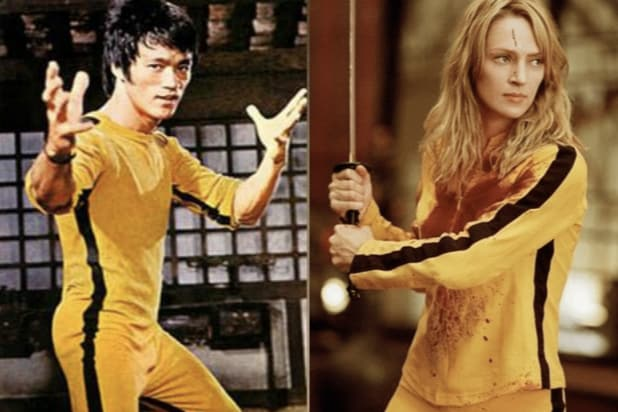 For example, the yellow suit he wore to battle Kareem Abdul Jabbar in “Game of Death” inspired the one Uma Thurman’s Beatrix Kiddo (aka The Bride) wore as she took out the Crazy 88, Gogo Yubari and O-Ren in “Kill Bill Vol. 1.” There might never have been a “Kill Bill” if not for Bruce Lee’s influence on American culture. It’s a natural decision for Tarantino to include Bruce Lee in “Once Upon a Time in Hollywood.” Of course, if you’ve seen “Inglourious Basterds,” you know he won’t let historical accuracy keep him from telling the story he wants to tell. Tarantino is only one of the millions Bruce Lee influenced. As Polly told us, he helped conceive the modern concept of celebrity, spread kung-fu fever across the United States in the 1970s, and inspired artists from Jackie Chan to the Wu-Tang Clan.